“God said: ‘Let us make man in Our image, after Our likeness,’” (Gen 1:26) after which He created Adam and Eve and all of humanity. Sadly, this divine image, as we know, was defaced in man when humanity committed original sin by disobeying God at the beginning of human history. We recognize this story as the Fall of humanity. Yes, it seems that we had it all in the beginning, but lost it all because of original sin. However, a late scholar named Jaroslav Pelikan offers a simple reminder in one of his books titled Jesus Through the Centuries: His Place in the History of Culture. He pointed out that Augustine of Hippo “made it clear…that the doctrine of the fall must not be interpreted ‘as though man had lost everything he had of the image of God.’” Nevertheless, this divine image in man required restoration. Therefore, God desired that a new person—in place of Adam—would begin de novo, and overcome temptation, sin, and death in obedience to God. He chose His only Begotten Son, the Word, as the New Adam to become flesh to fulfill this objective. Jesus Christ experienced the sufferings of our imperfect human nature while remaining sinless throughout His earthly life. The Son of God and Son of Mary was certainly impeccable given His divine personality. But what about the woman who carried Him in her womb and gave birth to Him? Given Christ Jesus’ intimate relationship with Mary as her Son, the Church has reflected since the early centuries on Mary’s holiness. A crucial question arising from this reflection was whether God would permit the woman that was destined to be the mother of the Holy One to be subjected to the universality of original sin as all people are. Hence, Pope Pius IX and his brother bishops prayed about and studied this topic during his pontificate. He and his brother bishops reflected on the teachings and practices that had developed over time concerning the doctrine of the Immaculate Conception. Certainly, there was already a general acceptance of this doctrine confessing that Mary was uniquely privileged with the preservation from all stain of original sin. was preserved free from all stain of original sin, is a doctrine revealed by God and therefore to be believed firmly and constantly by all the faithful.” In other words, Mary was “preserved free from all stain of original sin” from the first moment of her conception. 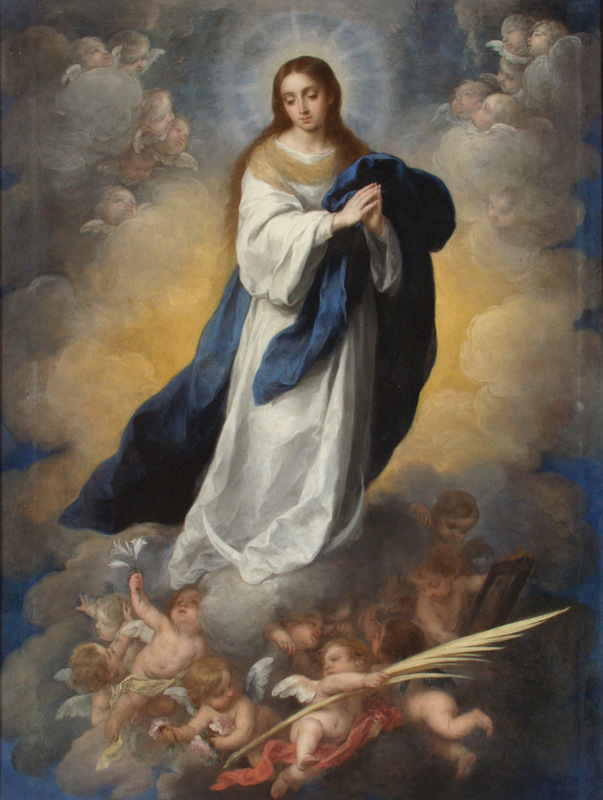 But, how was the Immaculate Conception possible and why was the Immaculate Conception necessary? God had created Adam and Eve sinless: from the very first moment of “conception,” if you will. Similarly, the Almighty God—Who wanted to do something new for humanity—manifested His power, wisdom, and goodness in bestowing upon Mary total sinlessness from conception as He granted to the First Eve. He chose to do so given that Mary is an integral part of God’s new creation of humanity through Christ. This “singular grace and privilege” was given to Mary by virtue of the merits of Jesus Christ her Son. The New Adam essentially redeemed Mary from the initial moment of her conception and made her the New Eve in this new work of creation. In addition, it should be noted that Saint Augustine spoke about the sinlessness of Mary many centuries earlier. He acknowledged that, “we must except [i.e. exclude] the Holy Virgin Mary, concerning whom I wish to raise no question when it touches the subject of sins, out of honour to the Lord; for from him we know what abundance of grace for overcoming sin in every particular was conferred upon her who had the merit to conceive and to bear him who undoubtedly had no sin.” (De natura et gratia 36.42) The Blessed Mother of our Lord was not only free of original sin, but, being full of grace, was also free of all actual, or personal, sin in her life for the glory of her beloved Son. The New Eve was impeccable, unlike the First. Since sin separates us from God, it was right and just for Jesus Christ to be conceived in a pure and sinless temple. If Mary had ever committed a sin, then there would have been a moment in which she didn’t belong entirely to God; she would just be a continuation of “the First Eve.” Consequently, she would have been unfitting for the Word of God to become flesh within her. Why then would Christ choose her over another woman to be His mother? When God stated, “I will put enmity between you and the woman, and between your offspring and hers,” (Gen 3:15) He was proclaiming that it would be impossible for there to be any moment in Mary’s life when she would commit a sin. Otherwise, there would be no true and complete enmity between the devil and Mary if there was ever a bond through sin. Her offspring, Jesus Christ, would need her perpetual “yes” to God for His glory. Indeed, “out of honor to the Lord,” Mary was preserved immune from all stain of original sin, and remained sinless throughout her life. Therefore, the Immaculate Conception is the Holy Temple (Is 66:1-2)—greater than King Solomon’s (1 Kings 6)—that God created from the very beginning wherein His only Begotten Son, the Word, would become flesh and make His dwelling. This should lead us to further reflection as disciples of the Lord, and as the Church of Christ. How do we prepare our hearts and lives to receive Christ Jesus? How are we living for Jesus Christ and cooperating with God’s grace? Indeed, this doctrine challenges us to strive to always live a life totally for Christ, like Mary did. It also challenges us to continually cooperate with God’s grace, which calls us all to holiness. May the Blessed Mother’s intercession assist us in attaining holiness and salvation.